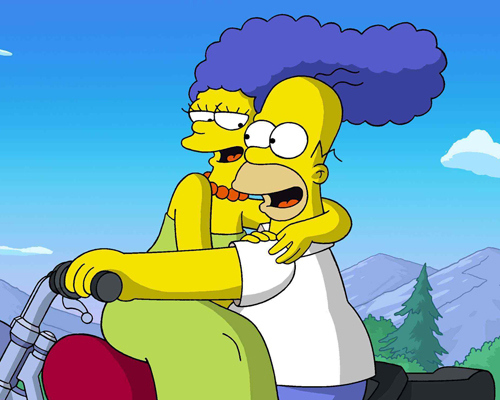 Geek Couples: Marge and Homer | Warped Factor - Words in the Key of Geek. Tony sings the praise of married love. Ahh, the Simpsons. America’s first family, they were teaching the world how to laugh at itself long before the Kardashians were a glint in a plastic surgeon’s eye, and despite being yellow, having a finger missing and being stuck with creepily Dorien Gray-style unaging children, they’re still more real than all the Real Housewives of wherever-the-hell-and-why-do-we-care. The Simpsons are successful for a three-fingered handful of reasons. They’re relentlessly inventive, with a townfull of characters to keep the plotting fresh and suggest plenty of real-world and pop culture pastiche. They’re rarely afraid to be funny, even at the expense of sacred cows, and perhaps most particularly, the emotions almost always feel real. They’re frequently undercut with comedy, but not where they need to stand. Bart and Lisa annoy the young bejesus out of each other, and aren’t afraid to fight like normal siblings do, but they’re also, ultimately, realistic as brother and sister, able to see their connection as sometimes more important than their differences. The relationships rarely descend into schmaltz except for the purposes of undercutting, but The Simpsons are not afraid to let emotion have its moments. If that’s true of Bart and Lisa, it’s so much more the case with Marge and Homer, the mother and father of the brood. They are, if anything, the best televisual representation in generations of the difference between love and romance, the difference between being in love, all hearts and flowers and grand romantic gestures, and loving someone, patiently, through the ups and downs of life. Let’s make no bones about this – Marge Bouvier was going places. She had the brains and, compared to her two sisters at least, she had the beauty and the joie de vivre in the Bouvier clan, however much she was scarred by her mother’s socially conservative (and, more to the point, socially accepted at the time) instructions to take all her negativity and doubt and push it deep down inside herself. 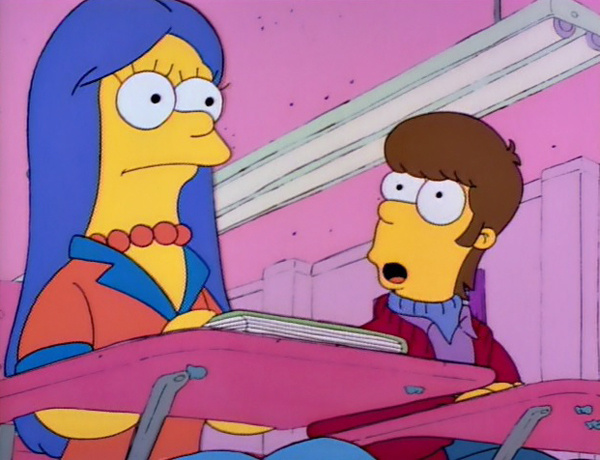 She had just begun to find her voice as a student when she discovered Homer J Simpson. To be fair, even then, it was hardly love at first sight – at least not on Marge’s part. Despite agreeing to go to the prom with Homer, she went off with the slicker, more handsome Artie Ziff on the night. Only when Ziff proved himself to be a creep did Marge really see Homer, and when she did, she was impressed by the simplicity of his adoration and his need of her. Homer J Simpson is a not wholly inaccurate distillation of white male American confidence and self-belief. He embodies the shortcut, the get-rich-quick, the half-assed at the expense of real applied effort, and he succeeds in spite of himself, a point that’s been made in the show’s universe more than once. He’s not afraid to try anything, and expects to be good at it irrespective of not having any experience, and he never does anything as much of a downer as ‘learning from his past.’ In one sense of course this can make him a wrong-headed, self-aggrandising, entitled boor of a man, and in his marriage to Marge, we’ve winced at his actions many times – from forgetting anniversaries to dashing the hopes of young daughter Lisa, to stealing the thunder of his diligent, artistic wife by suddenly becoming the infant terrible of the fashionable art scene, to getting the Simpsons deported from a couple of handfuls of countries, events, and holiday destinations. But, and this is the important thing, his dunderheaded refusal to learn that he’s not the be-all and end-all is endearing to Marge, and to us, because it represents something positive at the core – the have-a-go, grab-life-by-the-throat spirit that says to each of us, yes, just maybe, we too can tour with a rock band, jump a gorge on a bike, become a famous artist, go into space or win the love of our life. Maybe we can’t, maybe we’ll fall flat on our face or fall painfully into the gorge – but we can’t know that for certain until we try. 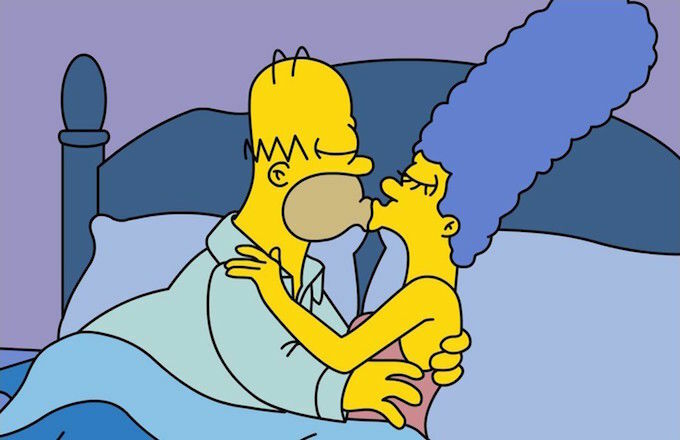 Homer’s winning of Marge, and their subsequent life together, is proof that there are no ‘leagues’ in love and attraction except the ones we construct in our own heads. Anything is possible if you let your heart speak through you. That said, it’s also important that Homer’s brash self-centred stride through the world depends on everything being all right with Marge and the kids. He assumes it is until they forcibly tell him it isn’t, but if and when that happens, Homer always, always means well, and wants to fix it. That sense of the importance of having a happy wife, and kids that at least aren’t heartbroken goes through the flabby yellow core of Homer J Simpson, perhaps stemming from his own upbringing of heartbreak when his mother left, and the brusque wisdom of his dad. He takes it as a point of principle to do his best for Marge and the kids. Even at the expense of his hopes and dreams, Homer does the right thing – as when he had finally achieved his pin-money dream job, and then Maggie was announced. Homer felt the wrench of pride, certainly, but he ate it, grovelled to get his family-supporting job at the power plant back, and sentenced himself to a life of drudgery again, because of that fierce commitment to his wife and family. Yes, yes, a thousand times yes, he gets things wrong, he lets them down in his self-important, macho strides into the world, he makes Marge cringe sometimes in the execution of some hare-brained scheme or other. But that’s what she sees in him – that commitment to doing the right thing, and that absolute adoration of her. Both the senior Simpsons in their time and their turn have felt the pull of temptation, the opportunity of another life, the hope for more with someone else than they have together. But both in their own way know that what they have together is strong, is special, and is worth sacrificing other dreams for. Homer’s goodness is simple, and in a complicated world, Marge responds to it. Marge’s kindness is pure, and Homer breathes it like he breathes oxygen. Ultimately, they’re in this world together for the long run, prepared to back each other even through their doubts, their dull patches, their fights and silences. Marge and Homer are a couple of genuine grown-ups, not afraid to still act like teenagers now and then. More than the laundry-white but other-judging Flanders and Lovejoys, and certainly more than the Van Houtens, who went the other way and found they didn’t have enough in common to weather the storms of mid-life opportunity, Marge and Homer are a functional, loving couple who will grow (at least in flash-forward) old together. They’re the epitome of long-term love in an uncertain TV world.